Now, we are inviting your applications for top image of Mouseion. 1. 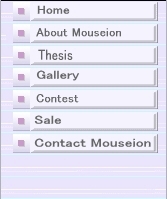 Mouseion is inviting the image decorating the opening part of our website. It describes symbolically Mouseion's whole activity, with the subject of Apollo and nine Muses. On Mouseion's top page, at present there is a tentative image that its founder Takatoshi Murayama made. However, as Murayama is not satisfied with it; we invite artists from all over the world to send your work that surpasses it. Please create an image according to the gist shown below. You can create the contents freely with your original idea. If you are confident in your creativity, we strongly recommend you to send your work. 2. We will present 1000 dollars as reward to the winner. There is not certain deadline for entries; we will accept your application until the winner is formally chosen. Announcement of the winner will be posted on this website. We will present 500 dollars as reward to an excellent work which is as good as the winner, even though it did not win this time, as special prize. Also, we will display all works applied at the special corner on this website. Incidentally, Murayama, inventor of tentative figure, too, is planning to make improved version at present. Winners of first prize and special prize will be selected by Taketoshi Murayama and Kyoko Kurusu, the co-managers of Mouseion. 3. Make an image in JPEG form, 800 pixels in width and 600 pixels in height. * Even if you send the image exceeds the above, we will compress it to this size. *We accept scanned handwritten works; in this case, be careful for the degradation of picture quality. *Send your work by e-mail as attachment to our address on this website. *When sending a work, write clearly your e-mail address, name and resident mailing address of the creator, and the details of the payee and payment method of reward as you like. * As for the gist of image, consult the tentative figure and the following details. 4.. 4. When you will send a work for top image of Mouseion, we hope to send another confident work you create by yourself together. If you wish, we plan to display it on special corner in our site. (Of course, this is not compulsion. You may send only the top image for application.) Incidentally, please make your image file of the original work JPEG form. The size of height and width is free. However, make file capacity equal to or less than 130 KB and do not put a frame in it. We will announce detailed condition about the display of this work once more later. If you have a question, use e-mail or BBS in this site.